Made out of .125 Aluminum and are pre-bent to fit the exitsting mounting holes in the hard top and body of the car. Made from .125 Aluminum these hard top mounts are laser cut, pre bent and individually stamped to fit the existing mounting holes in the hard top and the body of the car. 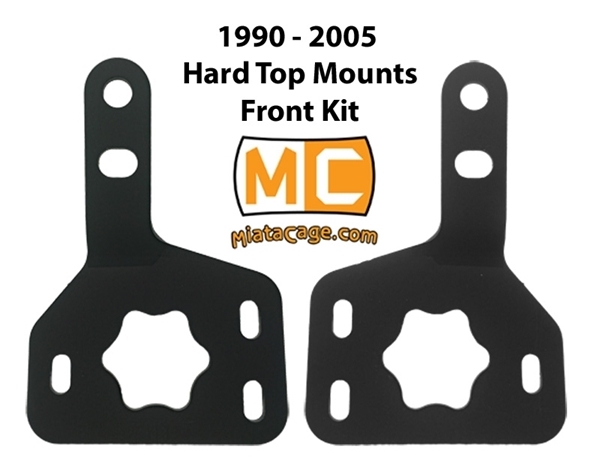 The Front hard top mounting kit consists of (1) left front, and (1) right front. If you need the complete set of hard top mounts click here. * Does not come with mounting hardware. We generally just use the stock bolts that come out of the factory hard top mounts that you will remove in order to bolt these plates on the car. If you want or need hardware, you can add a hardware kit from the drop down menu. The hardware kit consists of 10 shoulder/flange bolts for the body side and bolts and washers for the top side. 6 that attach to the top and 4 that attach to the body. Version 2 changes. 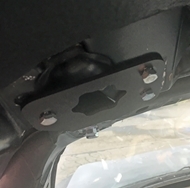 We re-designed the hard top mounts to fit better and mimick the hole slotting and direction of the factory hard top mounts. Version 2 fits much better and weighs less than V1.